Do you have a junior Picasso who’s used your leather couch as a blank canvas? Or perhaps your spouse got carried away whilst watching some science fiction and wrote down the formula for warp drive on the couch? Have no fear… there is a solution! Trade SecretTM Ink Away removes fresh ink, lipstick and pen marks from pigmented leather (Type P) and leather-like surfaces. 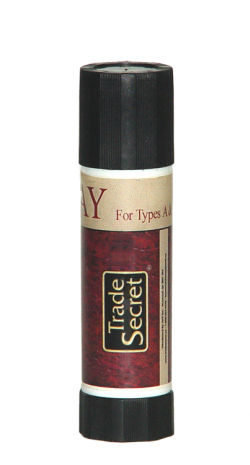 Results are best if the Trade Secret Ink Away is used within the first 5 days and if the leather has previously been treated with Trade Secret Protection Cream (which can be found in our Leather Care System). The leather MUST be cleaned with Trade Secret Soft Cleaner for Leather immediately after removing the ink in order to neutralize the Ink Away. Failure to do so could result in further damage to the leather. Note: If you have Aniline Leather (Type A), this product will not be effective. The best remedy for Aniline Leathers is to do nothing in the case of ball-point ink. Eventually the ink will pass through the leather and disappear.